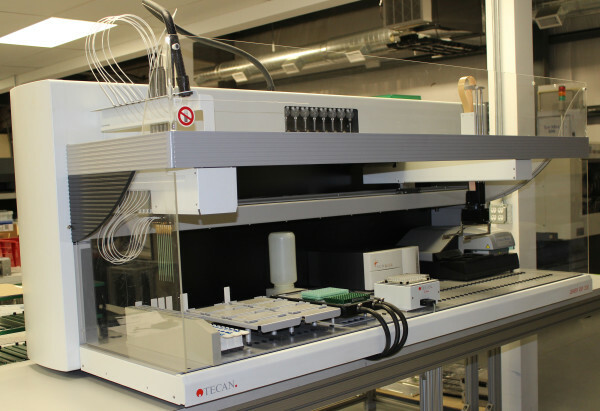 The used Tecan genesis 200 liquid handling system is shown with 2 arms, recirculating water bath, shaker, plate reader, plate washer, storage and birdfeeder trough, all selectable devices. 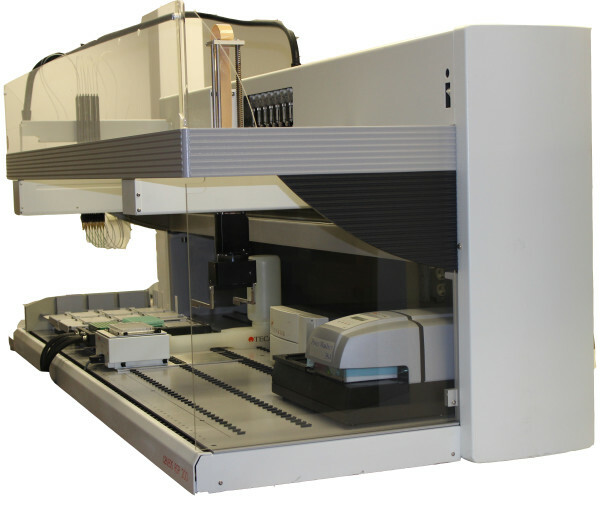 The Genesis 200 includes an 8 channel pipetting arm with independent z-axis movement and symmetrically variable y-axis tip spacing configured as either standard or disposable tips. Optional arms include the RoMa arm as shown. (See our FAQ for descriptions of these arms) . Depending on the assay there is an array of deck hardware that may be configured and integrated onto the instrument. These include barcode scanners (PosID2), shaker, deck storage, temperature control stations, reader, and weigh station, for example. There is typically a requirement for some number of carriers to hold various types of plates, tips, or tubes which can be purchased from Konnis. Some are shown here. 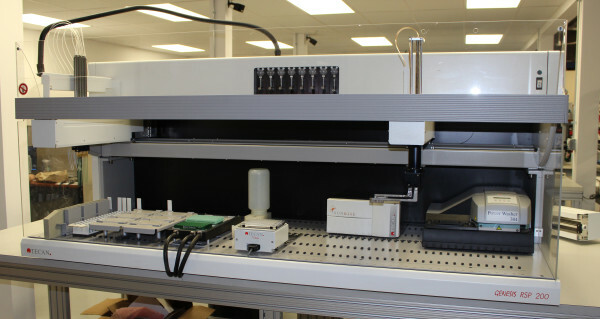 All Tecan instruments are configured with a Windows computer loaded with either Gemini and can be scripted for specific assays. An extruded aluminum table with locking wheels is optional. All instruments are fully refurbished in excellent condition and come with a minimum 90 day warranty. Application training is also included and may be extended to assist in specific script development.